Not that I am the last to post anything, I normally like to be the first for everything--My Arian (aries) nature I suppose, but I cannot help but congratulate and feature this amazing and beautiful actress. I did not get to watch any of the award ceremonies this season, however everyone was a buzz about Ms. Davis and what can I say she is amazing. Rare in Hollywood, this Tony Award winner and native South Carolinian, never allowed her dark hue to prevent her from her dreams, in fact it seems she has used it to her advantage.. She is known for her portrayals in movies such as Eat Pray Love, Antwone Fisher, The Help, Syriana and Traffic and Broadway production Fences. And let's not discuss this GORGEOUS DRESS!! she wore that..
Congratulations on your win and here is to more movie roles in the future! 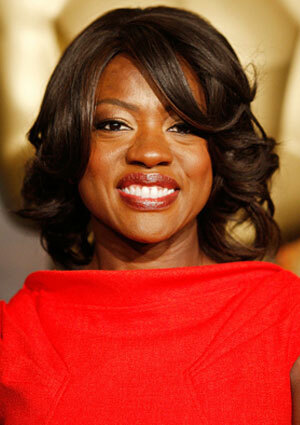 2 comments on "Beauty of the Week-- Viola Davis"
she is a really awe inspiring woman and i love that about her! her beauty transcends across the screen. i'm so happy for her and her success! go Viola!